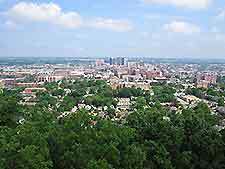 Known for being the most cosmopolitan city in the state of Alabama, Birmingham is worthy of a visit. Birmingham is home to a host of Art Deco buildings and many of the city's main attractions are located around Birmingham's Fourth Avenue Historic District, around Southside and also in the Five Points South area. The city of Birmingham offers a large selection of shops, restaurants and a vibrant nightlife, together with scenic views of the nearby Appalachian Mountains. Birmingham is becoming an increasingly attractive tourist destination and the city's museums offer an insight into the area's historic civil rights past, including the Birmingham Civil Rights Institute. Tourism in Birmingham is an integral part of the city's life and economy. The main tourist information centers in Birmingham, Alabama are the Historical 4th Avenue Visitors Center on 17th Street North, and downtown Birmingham's Visitors Center along 9th Avenue North. Both of these popular tourist information bureaus offer a range of in-depth information about Birmingham's many tourist attractions and also free walking tours of the city, together with the useful 'Downtown Historic Walking Tour' brochure. 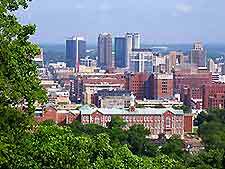 Hotels in Birmingham, Alabama vary considerable, with a vast selection of accommodation available at all levels. Birmingham's hotels are particularly clustered around the city's downtown district, in the Central Business District (CBD), near to the University of Alabama (UAB) campus, and next to Birmingham-Shuttleworth International Airport (BHM), which provides a range of ground transport options. 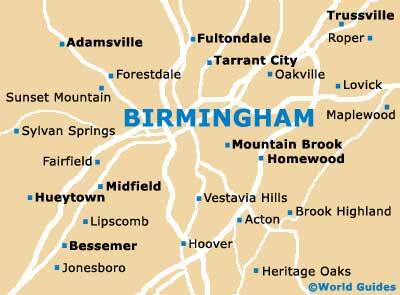 More information about Birmingham Hotels. Birmingham has many impressive tourist attractions, including Alabama Jazz Hall of Fame - featuring a wealth of displays and artifacts dedicated to Alabama's famous jazz musicians; Birmingham Botanical Gardens - with many acres of stunning gardens, including a spectacular Japanese Garden; VisionLand Theme Park - two exciting theme parks providing fun for the whole family; and Birmingham Zoo - with over 700 animals, all housed in their natural habitat. More information about Birmingham Tourist Attractions. Some of Birmingham's best art galleries and museums include Birmingham Museum of Art - offering an extensive collection of artworks from all over the world; and also the McWane Center - an impressive science center, which features numerous displays, including many hand-on exhibits, scientific information and an IMAX theater. More information about Birmingham Museums and Art Galleries.